6 × seven = Required Please enter the correct value. The Amazon stock price has skyrocketed 237.49% in the last five years because of Amazon's dominance as an online retailer. After all, traditional bookstores can suffer from excessive stock and large operation costs. Borders Group Inc. was forced into bankruptcy in 2011. Even Barnes and Noble Inc. (NYSE: BKS) announced that it plans to close eight stores in 2016. This may initially seem like an odd move, but we actually see the brick-and-mortar locations as a very bullish catalyst for the Amazon stock price. Wall Street had very high expectations for Amazon's Q4 2015 earnings report. Analysts had expected Amazon to report earnings per share (EPS) of $1.58 on $35.9 billion in revenue. Amazon missed on both estimates with $1 in earnings and $35.75 billion in revenue. Amazon's rising operating costs were another concern for investors. Operating costs totaled $35.6 billion, which was a 24% increase from last year. Shipping costs also jumped 2.5%. The day after earnings, the Amazon stock price dropped 6%. One of the challenges of retail in general is projecting the right amount of inventory to always have on hand. Amazon always had the advantage as an online bookstore because it was operating warehouses instead of stores. You see, Amazon uses its real-time data to determine what's trending in the book world. It can see the most popular titles being sold, and it can even break down geographic spending habits. This allows the company to tap into specific book signings and appearances that it knows customers will want in different areas. This also prevents the company from overstocking on items that may not have a high demand. Before opening its physical location in Seattle, Amazon never had a store where customers could test its products. In the physical store, customers can not only test out Amazon Kindles and its new Echo device, but the staff members can answer any questions in person. Now, it's true that Amazon isn't going to drastically increase revenue just through selling Kindles. In fact, NPR reported that Amazon is willing to sell its Kindle for a loss. The real power of selling a Kindle is that it is an introduction to Amazon's ecosystem. 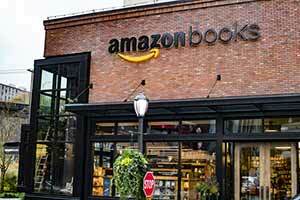 Amazon has a growing foothold as a music, movie, television, and e-book seller. Just from the sale of e-books in 2014, Forbes reported that Amazon reportedly earned between $256 million to $530 million. The more Kindles that are sold, the bigger the market for Amazon's services will become. When Amazon does open its second brick-and-mortar store this summer, it will benefit from being strategically placed between tech-friendly businesses. It will be adjacent to a Tesla Motors Inc. (Nasdaq: TSLA) store and across from an Apple Inc. (Nasdaq: AAPL) store. The Bottom Line: The Amazon stock price is down over 16% in 2016 because Amazon didn't meet Wall Street's expectations in its Q4 2015 earnings report. But Amazon opening a brick-and-mortar store is great news for shareholders. Amazon is creating new outlets to generate even more revenue from the multimillion-dollar e-book business. And showcasing its devices will help the company build a bigger foothold in the music, movie, and television markets. Looks like a good way to stay informed and looking forward to your newsletter. Thanks for checking out the article Carla! Glad to have you with us!